What Rock Has Mrs. Z Been Living Under? So, I'll admit it, I just finished The Hunger Games. Nope, not just saw the movie, just read the book - as in The Hunger Games, Book One in the series. Okay, I'm way behind on young adult literature (and apparently current pop culture as well). Forgive me, and give me just a second to finish crawling out from the rock I've been living under. I left High School teaching in 2006 and stopped working in public schools in 2008 in order to pursue a career in the business world. And yes, while it was the whirlwind fun that a 9-5 job promises, it wasn't nearly as satisfying as working with young learners. I missed the kids! So, when the Library Media Tech position at RHS became available, I jumped at the opportunity. Thus far, it has been the most fun I've ever had. I absolutely love going to work - that's frightening! Another frightening fact was that I had A LOT of reading to catch up on. As a result, I'll ask that you please be patient while I catch up on my teen reading - something I haven't done since...well...since I was a teenager! 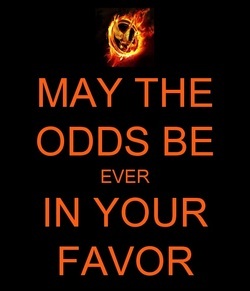 May the odds be ever in my favor, indeed. While The Hunger Games story line was not a typical book for me, it was a fast read and kept me intrigued. I couldn't put it down for wanting to know what the outcome would be. Now, if I can just get my hands on Catching Fire. We can't keep it in the library, which means it must be good, right? In the meantime, please visit the blog often to see my current reading lists and reviews. Feel free to comment and recommend good reads to me. Happy reading and GO BEARS! Mrs. Z is a former High School Teacher turned pseudo Librarian who is a self proclaimed "cool nerd." She loves all things books, school, library, and student-driven.